Excellent when minnows are around, but equally good at any time. The Sculpin is an American fly that Harry developed to suit local minnows in South Africa. Body : Antrim, 20% Brown, 20% White, 10% Orange, 50% rabbit fur. Rib : Gold oval wire. Wing/Tail : Strip of rabbit fur. Head : Spun deer hair. Gold oval ribbiing tied in at tail. 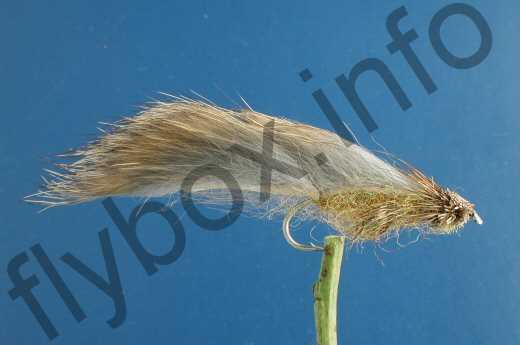 Leave about 1/4 inch back from head, Now tie in a strip of rabbit fur to extend beyond the end of the hook, forming a tail. Rib the strip with oval gold towards the head.Tie off the ribbing. Fins are partridge hackles tied in before you do the head and ribbing and body. Create the head with spun deer hair, trimmed to muddler shape. The top of the head is cut flat, angled upwards to strip of fur. Long shank. Currently there are no comments about the Sculpin SA fly pattern from other fly fishermen yet.